Quantities vary: Oil and vinegar must be sufficient to cover the sliced peppers. Extra virgin olive oil & wine vinegar. 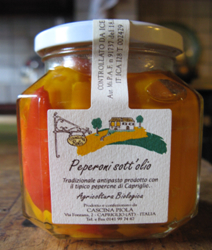 Take fleshy peppers (Capriglio peppers are ideal – see website of Slow Food), cut them into large pieces. Prepare a ‘bath’ with oil and vinegar in equal parts, salt and sugar in even quantities. Immerse the peppers for 30 minutes in the bath, then drain, put in jars and fill the jars with the same liquid used in previously taking care to mix well because oil and vinegar tend to separate. Aromatic herbs can be added to taste. Sterilize jars in ‘bagno maria’ for 15-18 minutes from the moment the water comes to the boil. Remove jars immediately from the pot. Nb. In this recipe ‘peppers’ refers to sweet peppers / capsicum not hot chilli peppers! Steam the asparapus (after carefully washing). Keep aside a dozen tips and cut the rest into small pieces to whiz with 3 eggs, the cream, salt and pepper. Prepare the pastry by mixing in a bowl the water and oil. Then add the flour bit by bit to avoid it becoming lumpy. If necessary add more flour. When ready the dough is smooth and elastic and peels away easily from your hands. Roll the pastry out thinly and place in the tray already lined with baking paper. 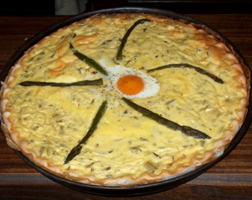 Pour the asparagus cream into the pastry, spread the tips (set aside previously) around like sunrays and break an egg in the middle (see photo). Place carefully in the oven. Bake for 30 minutes at 180◦C. Extra virgin olive oil, balsamic vinegar, salt. Depending on the season you can also use: raspberries, cape gooseberries, black/red currants, grapes, apples, kiwifruit and oranges. 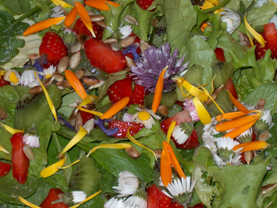 For the use of other flowers ensure you check accurately that they are for human consumption. This is a typical dessert of Piedmont. 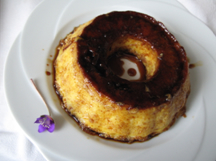 It’s name derives from the shape of the dish used traditionally – bonèt means small hat. Nowadays the chocolate version is well known. This being an antique recipe, and considered a recipe of the poor, of the Asti region, there is no cocoa. Whisk well all ingredients (less sugar for caramel). Caramelise the sugar in the chosen baking dish then pour mix into the dish and bake (in water bath / bagno maria) for 40 minutes at 200◦C.Check by inserting knife blade it must come out perfectly dry. Wait until cool, place in fridge then turn out just before serving.